This is the first Israeli film I've ever seen, and my first movie with lesbian content (though I've seen my fair share of TV lesbians). Also, I'm not Jewish and I know as much as the average Catholic does about Judaism, so if I commit any faux-pas, forgive me. Then again, political correctness has never been my strongest suit. FYI: I watched this raw (the film is in Hebrew and French), so there's that, too. 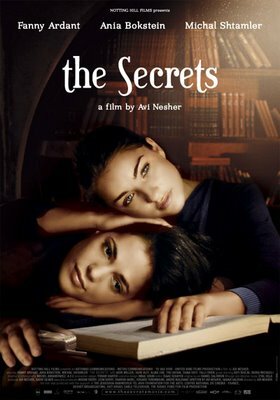 The Secrets centers around a pious girl, Noemi (Ania Bokstein) who, being the daughter of a well-respected rabbi, is learned on the orthodox faith. The film begins with the funeral of Noemi's mother and an awkward conversation with Noemi's fiance, but soon moves to an all-girls' seminary school. Noemi shares a room with three other girls -- the fat one, the funny one and the rebel. The latter is named Michelle and is from France and smokes (because she's from France!) and is rather individualistic. In other words, the complete opposite of Noemi. Needless to say, the two girls initially clash, until a serendipitous meeting with a mysterious French woman (who also smokes, because she's from France!) from next door, played by Fanny Ardant, help them see something bigger than themselves and their egos, gain a deeper understanding of their faith, and find an unexpected love that is forbidden in the heavily repressed society they live in. First up is cinematography. The picture looks great. I like many of the choices made for the camera angles and the lighting. Two scenes particularly stand out. One with Noemi and Michelle walking while alternately talking and arguing about their French neighbor and the camera shows only their legs through a small grilled opening on top of the stairway. That was odd, yet strangely interesting. And the other is the dramatic confrontation between Michelle and Noemi after they both came back to the school before the holidays are finished. It's all shadows except for a shaft of light that falls on Michelle's devastated face as she voices out her guilt and doubts about their relationship. There was also this scene with the two meeting clandestinely among the laundry lines. I thought it was a very smart shot but also kind of done before. Although I liked that scene, too, especially the lighting, it was also a little iffy because of the mushy conversation and predictable turn of events. That said, the script could be a little tighter. Yes, yes, I may not understand the language but scripts also translate visually and in that aspect I don't need Yiddish lessons. There are points in the movie where the two protagonists are talking whatever and the scene suddenly shifts to Ardant emoting over her various bodily and spiritual pains, that serve only to confuse the viewer. I, for one, sure was confused, even if others aren't. All I'm saying is, was it necessary to do it like that? Another is the lesbian relationship portrayed. While very touching and quite believable, my question is the same: was it necessary? Because the movie isn't really about lesbianism but about redemption and forgiveness and how one is supposed to get both through a faith that is bound by tradition, and ultimately it is about love -- the universal kind, not just the sapphic/romantic sort. The title 'secrets' come from the fact that the girls have to hide their helping the French woman find God because 1) she's a social pariah and has committed a lot of despicable sins; 2) women are not traditionally taught certain Jewish studies and certainly should not perform rituals reserved only for men; 3) the girls are still students even though Noemi is cleverer than most learned men; 4) there are basically no laws that apply particularly to the woman so that Noemi has to invent her own set of rituals for soul-cleansing; and the most important of all, 5) the French woman is not even Jewish. Le gasp! One could also argue that the other secret here is the blossoming relationship between Noemi and Michelle, but again, I would argue right back: was it necessary? It was nice fodder for drama and gave the otherwise one-note Michelle character a little dimension and an interesting developmental twist in the end, but it wasn't terribly necessary to the entire plot. It didn't even add to the central character's development. In the beginning of the film, Noemi has faith but even as she silently follows the orders of tradition, she isn't entirely blind and she senses something missing. What she lacks is the courage of her conviction and this she eventually gains at the end of the film, certainly not because of Michelle, but because of her deeper understanding of God and of her faith. The performances from the three main women were top-notch. Apparently, Franny Ardant is a notable in French cinema and a veteran actress so that kind of explains her screen presence. What was wonderful to see was how the younger actresses, Bokstein and Shtamler, were able to hold their own against such a formidable star. They weren't overwhelmed, to say the least. In particular, Bokstein was luminous in her role, and Shtamler, who I'm saddened to find only has this film in her credit according to IMDB, portrayed Michelle's confusion and uncertainty exceptionally well. Also of note is the actor's portrayal of Yanki, the clumsy, bumbling clarinet-player who falls head over heels for the sunny Michelle. All in all, a good film and I certainly enjoyed it. Although the plot is intricately connected with religion, it isn't heavy-handed and it provides a fascinating glimpse of the Jewish traditions.